Why should I install a standby generator? If you live in Los Angeles, it is essential to have a backup power supply. The LA Times has reported that there will be power outtages in the future. Parts of our city are still suffering from the impact of the four-month-long gas leak at Porter Ranch. This is the perfect time to review your home power situation, and ensure you don’t get caught without power. Some areas in Greater L.A. suffer from regular power outages and there is always the threat of earthquakes which may leave you without power for hours or even days. A.D.I. Electrical Services are experts in installing and advising on the best kind of house generators to keep you safe and powered up! You want to keep your family safe and your home running smoothly when there is a power outage. A backup generator is the ultimate insurance policy to ensure you have power for the basic functions – a standby generator will light your key areas and provide electricity for daily essentials like your Air Conditioning, Kitchen and Bathroom. A standby generator is even more essential for elderly residents or parents with young children. Senior citizens may require power from a standby generator for medical equipment, while babies and young need clean clothes, cooked hot food and practical necessities. A.D.I. 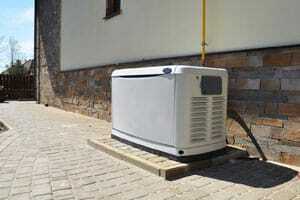 Electrical Services will install the standby generator for you. What are the key misconceptions about house generators? Some people believe that a standby generator is to power your whole house as usual. This is not the case. The purpose of the generator is to keep you going with your home’s essential functions. Typically it powers 6+ circuits. These may include your air conditioning, bathroom lights, stove, kitchen lights, and security lights. Lifetime Warranties & Peace of Mind with A.D.I. Electrical Services. Our approach is to provide value for money, cost-effectiveness and peace of mind. The standard warranty is for one year, but we go one step further. With A.D.I. you get a LIFETIME WARRANTY. We started in 1996 and have many repeat customers. Thousands of stories, thousands of jobs, thousands of happy customers and thousands of smiles. We want to make you smile, keep your home safe. Light up your life with A.D.I. Electrical Services. There are many happy customers we have served during the last 20+ years. Don’t just take our word for it – the proof is in the words of the customers who have experienced our work. You can ready many of their reviews on Angie’s List. Which Standby Generators do you recommend? There is a big selection of generators on the market, available from Home Depot and other suppliers. We prefer Generac Generators – they are reliable, powerful and come with an excellent warranty. Other choices include the onan generator, yamaha generator, kohler generators, inverter generator, diesel generator, electric generator, natural gas generator..but we prefer generac generators every time.